These updates are getting few and far between now - I'm not sure how many I'll actually have left. The days are absolutely dragging in, but the weeks are flying. I cannot quite believe that there is only 2 weeks left until my due date. Honestly, I don't know where the last few months have gone. 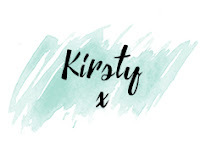 I'm so excited to meet little bub, and for my pregnancy to be over, as we all know I've not exactly enjoyed it, but as I get towards the end I am getting more and more anxious about motherhood. I'm guessing that's completely normal though - it's a big change. I've also brought the start of my maternity leave forward - I was due to work right up until 39+4, but I was absolutely floored this week. I can't explain how exhausted I was, and it just didn't seem like the smartest of ideas to push myself that far that close to my due date. My work is relatively easy, but the 5am starts and lack of sleep was less than ideal, so it was time to make a decision for my health rather than my bank balance. I've well and truly ballooned at this point - I'd been eager to try and gain as much weight as I could in the past two weeks, just on the off chance Baby J's slow growth was down to my food choices, so I've been shovelling in the food, and I think it's very obvious by this picture - I am no longer all bump by any means! Earlier today I had another growth scan: I had mentioned in my 36 week update that during my scan the midwife had expressed a few concerns about Baby J's growth. He was not overly small, but his growth rate had appeared to have plateaued, so they organised a scan for the week after. This wasn't a huge concern - simply a 'better safe than sorry' measure. The growth scan couldn't have better, Baby J has managed to gain 0.7kg in the past 2 weeks, and has ended up right back on the average line, and everything was looking healthy. Obviously scans are unreliable - but at least there was no glaring issue and I now feel a lot better nearing my due date. I'm still not too much different than I have been throughout my entire pregnancy. Yawn. I'm still tired, my ankles are still huge and I'm still bloody bored of being pregnant. - Mild nausea has been coming and going, nothing too severe, but enough to make me mildly uncomfortable. Speaking of nausea, the smell of coffee and eggs these days is enough to completely turn my stomach. During the first and second trimester I practically lived off of these two - so it's so odd for it to be like this now. Speaking of which, it's odd that I'm getting nausea in the third trimester. I always expected this to have came earlier, but I suppose I could only hold it off for so long. My Myrtle and Maude tea has been helping a lot though, and at least I'm not actually being sick! - Very mild cramping is also there - I don't want to call it cramp as such because it's really not that severe, it's not painful at all, I can really only think to compare it to the dull ache you get in the lower abdomen the day before your period. It's not sore: it's just there. I do however have a bit of pain in my back, not my lower back as you would imagine, but between my shoulder blades, probably just from my posture going to pot to compensate for the little chunk in my belly. 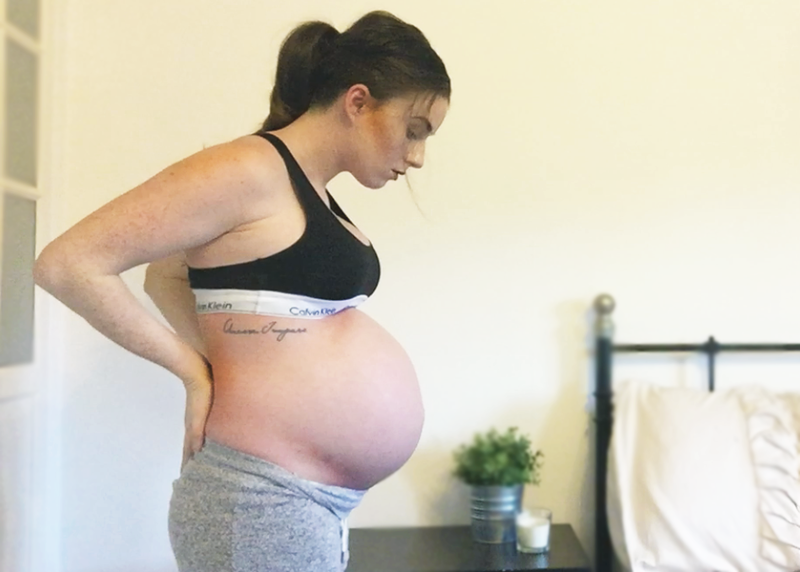 - Baby J has definitely moved down - I don't know wether he is engaged or not, I'm yet to be told, but I do feel as though I have a bowling ball between my legs. I've now resorted to waddling, and I have a constant need to pee. The folks in my office must get a right good chuckle when I have to waddle the 40 metres to the toilet every 15 minutes without fail - thank god I'm finishing up early! - I don't smell nice at all. I don't know what is going on - but I'm currently having to shower twice a day and I still never feel clean, I feel as though there is just a constant smell. I don't know wether it comes down to just having gained weight, so feeling bigger and it's in my head that I smell, or wether it is my bodies reaction at the end of my pregnancy, but either way it's a symptom I'm not happy with at all. My skin has also taken a hit, I seem to have broken out for most of my third trimester, although that might just be down to less than healthy food choices, but either way I'm not looking great. I'd originally intended on dedicating a full post to my Birth Plan, but if I'm honest, it doesn't really warrant one. My midwife has not discussed anything with me - I've not been given the option of a water birth and a home birth hasn't even been mentioned. It's simply been a case of give the hospital a ring when your well into labour and then we'll take it from there... classic NHS. I have every intention of staying in the house as long as possible before going to the hospital - I have my birthing ball, my TENS machine and I'm praying I can make it a fair bit through before having to go in. Obviously without leaving it to late - the idea of being in the hospital longer than necessary freaks me out. This does throw a spanner in the works in that I would like to take every single drug they are happy to give me.. I'd have liked the epidural, but I know I won't get one if I'm too far along. To be honest, there's no point in me even planning anything. I'll go with the flow and I'll go on midwives recommendation - I've never been through labour and every experience will be different, I'd rather have someone who's more knowledgable make the call than do it myself.